EA's Dungeon Keeper MMOG is still in the works. After a year and a half, new details and concept art have been revealed. Since it was announced in 2008, news on the Dungeon Keeper MMOG has been practically nonexistent. This isn't too surprising, since no plans have been announced to bring the game to Western audiences any time soon, but new details have surfaced about the title's development. The good news is that the game is coming, but the bad news is that it's still only coming to Asian markets. MMO Culture has managed to get its hands on some new concept art, as well as a couple of story details. Dungeon Keeper World is still being developed by MMOG veteran TQ Digital (the company behind Fantasy Disney Online and Heroes of Might and Magic Online). The game is apparently going to be presented in fully-rendered 3D; yes, apparently this was in doubt. There are going to be two different game modes: above and below ground. Above ground, the players participate in a game that is presumably the same as most other fantasy MMOGs on the market. Under the game's surface, though, the spirit of the Dungeon Keeper series will live on, as players work as evil lords building up their own dungeon empire. So far, the only playable race that's been revealed is the Demon race, but apparently more will be available when the game finally launches. The concept art for characters and environments is nice enough, but it also looks like your typical fantasy MMOG artwork. Davey Jones's long lost twin (pictured at right) definitely gave me pause, though. 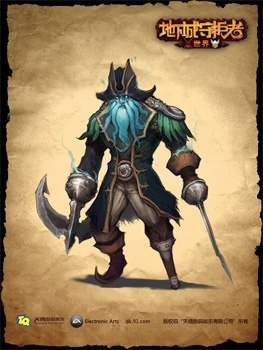 Maybe there's a Demon Pirate character class, which would be awesome. Some sort of incarnation of the Horned Reaper, affectionately known as "Horny" to fans of the series, is also present in the concept art, but what his role will be in the MMOG is unspecified. What made the Dungeon Keeper games so much fun was the tongue-in-cheek attitude that was present when they skewered fantasy stereotypes. So far, none of that humor seems to be present in Dungeon Keeper World, which is worrying; this is too great of an IP to flush down the tubes of mediocrity.